Valtteri Bottas has signed a new contract with Mercedes to race for the Formula 1 world champions in 2018. The Finnish driver joined Mercedes on a one-year deal in January 2017, as a replacement for retired world champion Nico Rosberg. The 28-year-old is third in this year's drivers' championship with two wins from 13 races. Team-mate Lewis Hamilton leads the standings. Bottas is in his fifth season in F1, having also driven for Williams. "When the team hired me for the 2017 season, they took a leap of faith by putting their trust in my skills," said Bottas. "This new contract shows that I've earned that trust." 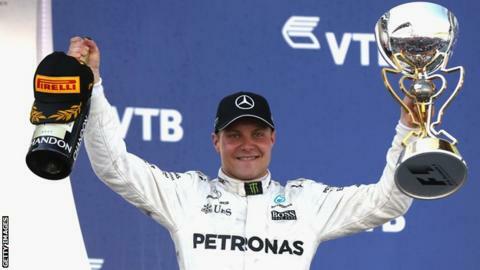 Prior to joining Mercedes, Bottas had never won a race and had achieved nine podium finishes, a figure he has already matched this season. Mercedes boss Toto Wolff said: "Bottas' upward trajectory made it a no-brainer for us to continue with him into 2018. "The chemistry and dynamic between Valtteri and Lewis works and are what we need to take the fight to our competitors." From the moment Valtteri Bottas was drafted in to replace world champion Nico Rosberg for this season there was always going to be a strong chance he would stay on at Mercedes for 2018. Bottas has done the solid, reliable job Mercedes wanted. He has taken points off Lewis Hamilton's title rival Sebastian Vettel by winning two races when the Briton has had off weekends, backed up Hamilton well elsewhere and put the team in a strong position to retain the constructors' title. The big question is what happens next year for 2019. The fact Bottas has been given only a one-year extension is a reflection of the fact both Red Bull drivers are potential candidates for a Mercedes drive then. Daniel Ricciardo is definitely out of contract at the end of 2018 and Max Verstappen is said to have clauses in his deal which mean he might be. Whether Hamilton renews his contract after 2018 or not - and he says he wants to - either Ricciardo or Verstappen might be too big a temptation for Mercedes to turn down.